In the history of psychical research, no medium was more confounding than Eusapia Palladino. 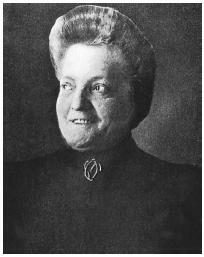 She was extensively investigated in 1908 by the Society for Psychical Research and again in 1910 by a magician (William Marriott) who supposedly exposed her as a fraud–however, there were members of the SPR who maintained that the Marriott investigation was itself questionable. Palladino is just one example of the curious mix of truth and fraud in paranormal research, and indeed represents a larger, more pervasive issue: why do we all feel the need to temper what is real with what is manifestly false? I have some thought on this issue (what a shock). First of all, there is tremendous pressure to “produce” something exciting and paranormal when nothing is happening. If we are to be totally honest, we have all–to some degree–invented or greatly exaggerated a paranormal “event”. Pallidino was famous for inventing, sometimes quite ineffectively, a shocking phenomenon for the benefit of the observers. She was an entertainer as well as a medium, and it was nearly impossible for her to sit through two or more hours of sheer boredom. That brings me to the next point. Waiting for the unknown to manifest itself can be tedious at best, and at times painfully dull. All one has to do in order to revive the proceedings is to pretend that something has touched you, pulled your hair, or created a cold breeze. I am NOT accusing anyone or any group of inventing data, but I am saying that there is a temptation to fabricate personal experiences. I personally don’t know anyone who deliberately falsifies evidence or seeks to create phenomena with the intention of committing fraud, but it would be naive to think that such fraud doesn’t exist anymore. In an era where we can digitally alter photos, video, audio, or just about anything, fraud is practically assumed from the beginning, or at least self-deception. I think that we have traveled a different path from that which Eusapia followed. 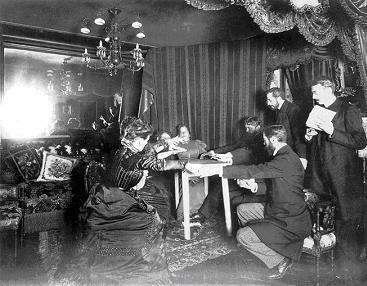 In the days of seances, men and women were willing to sit and wait in the dark for hours on end, over a period of months and years, to see what the Other Side might bring to the faithful. Now are inundated with technology, and the possibilities for fraud are endless. We are jaded by Photoshop, creative video editing, television shows that purport to seek out the “truth” but end up–like Eusapia–deceiving us in the dark. At the turn of the last century, it seemed possible to prove that spirits could contact us, as long as we were able to put into place the necessary restraints and restrictions to prevent the medium from engaging in creative footwork. Now, there is no evidence that can be accepted as authentic due to our own tremendous capacity for creative fraud. Let me clarify: there is no evidence that a paranormal team can produce that can be 100% cleared for fraud. We don’t have degrees or institutions that provide the structure and rigor of an academic program for paranormal psychology. There is no generally accepted “culture of evidence” or rules for authenticating data that we all agree upon. We are on our own, learning as we go, training ourselves, and no program of study supports us or provides the intellectual backbone we desperately need as we try to figure it all out independently of each other. There are thousands of paranormal groups all replicating each other without sharing information and arriving at standards of practice. Therefore, nothing we produce as individual teams carries any real weight; we are all in a tacit competition with each other, so who is going to take seriously someone else’s data? Most people have desires that trump intellectual curiosity. We want power, authority, popularity and money. Eusapia was no different. Her fear that everyone would abandon her if her real abilities failed to materialize controlled her behavior as a medium. She DID have real, paranormal abilities to connect to what we call the ‘spirit world’, proven by many careful investigators over several decades; however, it was not enough for her to occasionally produce amazing feats. She needed the admiration and excitement of everyone at every sitting. To that end, she was endlessly creative in her fraudulent practices. The truth always seems to come wrapped in lies. I don’t know why this is the case. To arrive at the authentic, you have to wade through a sea of deception, both conscious and unconscious. Not only that, we have to contend with our own need to create a reality where we are more impressive than we believe we truly are. The show that we put on for ourselves and for others is what distances us from the real mystery. We may have to wait in the dark for months, years, enduring boredom and uncertainty, but if we are truly patient and authentically ourselves–without apology–then the heart of the divine will reveal itself to us, slowly, beautifully, eternally.